One approaches Monsieur Lazhar with the knowledge it has won numerous awards and gathered plaudits all over the world. If this wasn’t enough to raise one’s suspicions, the fact that the film was made in Canada is another cause for alarm. I don’t think any country is more adept at producing movies that promise so much and deliver so little. How very pleasing it is to be able to say that Monsieur Lazhar is a masterpiece. It is not exactly a cinematic masterpiece, because it is unremarkable in formal terms. It is a powerful and moving piece of story-telling that draws us in like a great realist novel. This is all most people are looking for in a movie anyway, and it is a thousand times better than those ubiquitous action flicks that use the full technical resources of the cinema to such pointless effect. Where this movie hits home is in its non-didactic exploration of two significant social issues: the plight of refugees, and the widespread confusion about the way we perceive and treat children, especially in the school classroom. It also has much to teach us about death and grief. The story is set in Montreal, capital of French-speaking Quebec. It begins with a schoolboy, Simon, making a grisly discovery: his teacher, Martine, has hanged herself in the classroom. The ramifications of this shattering event will linger over everyone, conjuring up feelings of bewilderment, sadness, guilt and displaced anger. It’s hard to get a teacher at short notice, and one day Bachir Lazhar appears in the principal’s office, announcing he is a Canadian resident with 19 years’ teaching experience in Algeria. He is ready to start right away if accepted. Although it is contrary to the usual procedures, the principal agrees to give him a try. Monsieur Lazhar proves to be strangely old-fashioned, setting a dictation test from Balzac’s La Peau de chagrin, and rearranging the desks into strict rows. Gradually he wins over the class with his kindness, his innate courtesy and good nature. He is frustrated by the regular visits of a psychologist who comes to help the children deal with the after-effects of his predecessor’s suicide. He feels there are more direct and sympathetic ways of closing this wound. Lazhar can understand suicide but he cannot understand why anyone would kill herself in a school classroom. He feels there is more to this tragedy than the assumption that Martine was ‘disturbed’, and works to solve the mystery. What nobody knows is that Lazhar himself is not a resident but a refugee, still waiting to have his status confirmed. In Algeria his wife had written a controversial book and received many death threats. Shortly after he had left for Canada to clear an escape path, she and Lazhar’s two children died in a fire, almost certainly deliberately lit. This is one of the secrets that Lazhar carries with him, the other is that he has no teaching credentials whatsoever. His wife was the teacher, while he ran a restaurant. We watch this unqualified teacher win the trust of his pupils, struggle quietly with the prejudices of some of the parents, and make friends, even an admirer, among the other members of staff. 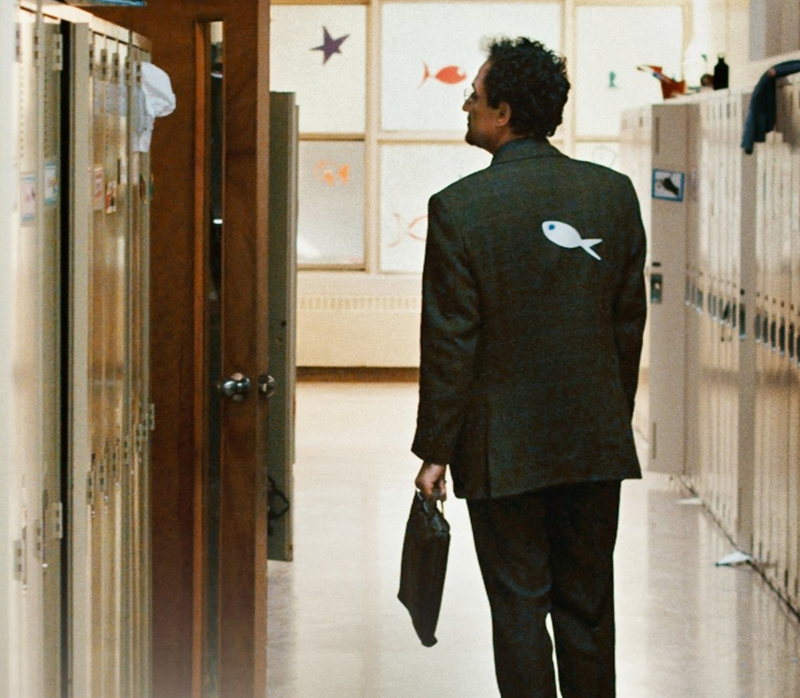 The child actors in this film are extraordinarily good, which must be at least partly due to the skills of director, Philippe Falardeau, who also wrote the script. Lazhar’s favourite is Alice (Sophie Nélisse), whose maturity belies her youth. The problem child is Simon (Émilien Néron), who has unresolved issues with the late Martine. School is one of those almost universal experiences that leave lifelong impressions on us, both good and bad. There have been countless films set in the classroom but few have managed to avoid the perils of mawkishness and melodrama as adroitly as Monsieur Lazhar. This is to the credit of Philippe Falardeau, but the success of the film owes a huge debt to Mahomed Fellag, in the lead role. A wellknown Algerian actor, now resident in France, Fellag’s performance is masterful in the way he makes the smallest gestures and expressions carry a weight of meaning. With his old-fashioned ways, Lazhar is disturbed by the rules and regulations of the modern school. He finds it hard to follow a modish cirriculum, and believes children can find joy in their work without having to be treated like patients. It is a simple fact that an emotional bond often develops between teachers and students, a bond that can have very positive effects. Yet in the legalistic, bureaucratic tangle that surrounds the contemporary classroom a reassuring touch on the shoulder or a hug can have dire consequences. Coming from a culture where such strictures do not exist, Lazhar’s brief career as a teacher makes us conscious of just how rigid and unnatural our attitudes to children have become. In the increasing sophistication of educational ideas, something fundamental, something from the heart, has been lost.